There is a range of products that will save you money on your energy bills. Some renewables might even earn you money in the long term, meaning it quite literally, pays to go green. It has also been reported that energy efficiency measures can add up to 16% to a houses value. The term renewables describes a source of energy that isn't depleted by use, such as water, wind or solar power. Renewables provide an alternative to gas, coal and oil powered energies, which are limited resources. What types of renewables are available for home use? Solar PV allows you to generate and use your own electricity. Any additional energy that you generate but don't use will be exported back to the grid, for which you will be paid a 'feed in tariff' from your energy supplier. Solar thermal can be used to heat your hot water and also in conjunction with other renewable heat systems. Biomass boilers use pellets or logs sourced from secondary wood. They are a very efficient option to consider and work at high temperatures, similar to fossil fuels. Biomass boilers are an ideal alternative to replace expensive and messy oil based systems in both new builds and retrofit rural properties. Air Source Heat Pumps (ASHP) transfer heat from outside to inside a building. It uses a refrigerant system involving a compressor and a condenser, to absorb heat outside a building and release it inside as hot air, hot water radiators, underfloor heating and hot water supply. Ground Source Heat Pumps (GSHP) work on the same principle as ASHP but instead of utilising heat from the air, they use heat from the ground via an array of buried pipework. Water mixed with antifreeze is circulated through the pipe system and heated by the earth, which at one metre below ground level has a temperature of 6-12 degrees. Both air and ground source heat pumps can earn income from the Renewable Heat Incentive. Insulation will improve thermal efficiency in your home, increase your energy rating and reduce heating costs. Installing a heat recovery system will create controllable ventilation throughout the building, reduce moisture from the air and lower your energy bills. Consider LED lighting, which has a long lifetime, is easy to retrofit and gives huge energy savings when compared to traditional lighting. Underfloor heating is more efficient at heating a room than radiators as it distributes heat uniformly throughout a whole room. It is perfect for using with air or ground source heat pumps and there are systems suitable for everyone, whether you are installing it in a new build or as a retrofit. 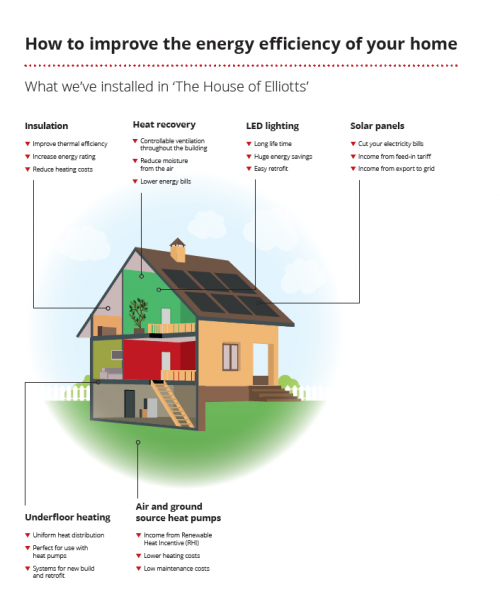 Elliotts are able to offer assistance with all these solutions with installation packages for solar, heat pumps and biomass boilers.